I may have missed the point. I may have benefited from doing the assigned reading . . . or showing up on time to class . . . or coming to the class more often. I was a Millennial before Millennials were a thing. I was Gen X, and I was supposed to be full of angst, but I determined then and there I was “self-actualized” and I was as good as I’d ever get. It was like a rare moment of clarity inside a 5-year college career that’s mostly a foggy memory. But Professor Voss (who’s since passed away) was the best Professor I ever had and his classes were like a combination of motivational speeches, fascinating psychology lectures, and inspiring life lessons. Don’t get me started on the concept of “rights of passage” and how important they are to culture and tradition and realizing a common good and common societal goals. See, Dad . . . your money wasn’t completely wasted (and either was I the entire time). Anyway, since then I’ve always felt fairly self-actualized, even though I know it’s impossible and while I might think I’m operating on a higher emotional and intellectual plane, I’m probably not. I wonder sometimes if I could do more and achieve more if I exercised a little more humility and tried to grow and get better. Then I wonder, “but does anyone really drive that hard?” And then I get my answer when I read about a guy like Tom Izzo. Often times I think you and I see really wealthy people and we think, “right place, right time,” or we think, “must be nice.” And I’m certain there are rich people who just sorta lucked into things. But the more I meet successful people, the more I seem to notice they’re all stuck in a lower stage or Maslow’s Hierarchy of Needs and they’re never satisfied. For a guy like Izzo, a guy with plenty of money in the bank, especially for a humble guy from humble roots in Michigan’s Upper Peninsula, a guy with a list of accomplishments in his field of work that make him one of the best of all time, he doesn’t even seem close to being self-actualized. If I were him, I’d probably start to take my foot off the gas pedal, I gotta admit. Yet every time I turn around, I hear about Izzo going right from a game to the airport and flying to Chicago to sit and watch a high-school sophomore or junior and talk to some coaches and parents, only to jump back on a plane to race back to East Lansing and coach his current team. And somewhere in there I’m guessing he must spend a few minutes with his wife and children. But how? In essence, 100,000+ Spartans enjoy immense joy and satisfaction from our MSU basketball team because our coach hasn’t achieved self-actualization. We’re lucky he’s ours. On Sunday, Wisconsin upset Ohio State and Izzo earned his 7th Big Ten Championship, and did it in a year nobody expected anything from his team. What did he tell his team? Yikes. Thanks, coach. What a buzz kill! 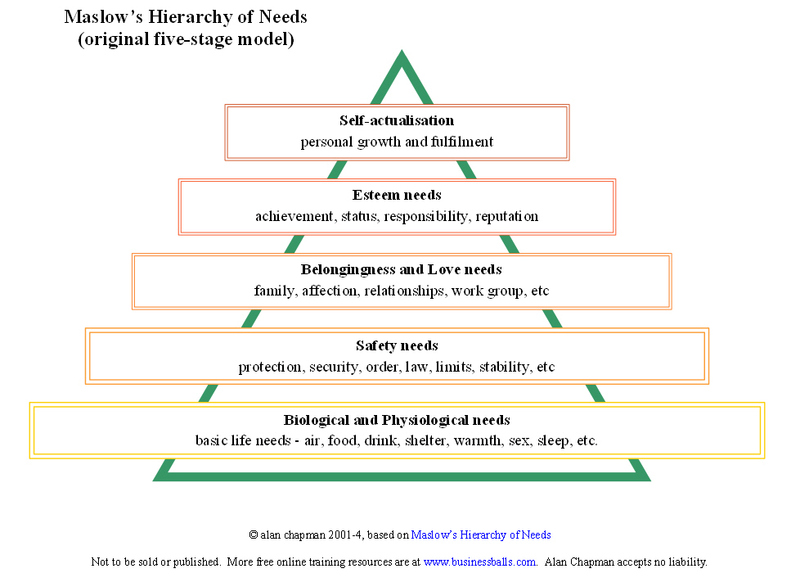 I read so many things that tell me “be happy” and “count your blessings” and “realize things could be worse.” Well, maybe today I’ll try and make myself miserable in the same way Izzo does and knock myself down a peg on the Maslow chart, and start to work towards true self-actualization. If I’m currently having some success and earning a little money writing, I should want more and I should want to write a best-seller. If I’m currently enjoying some nice success and and stability at my day job, maybe I need to focus on the parts of my job that I’m not very good at, and work to be the best in those areas. If I think I’m a pretty good Dad and husband, I’m going to have my family help me make a list of my faults and short-comings, and I’m going to try and be the Tom Izzo of fatherhood and marriage. What is the marriage and family-life equivalent of a Final Four and a Big Ten Championship? Are you self-actualized? Or are you, like me, self-limiting and fooling yourself? I’m going to find out.